I don’t hate much. I am irritated by lots, bothered by bunches, hate very little. I actually had a conversation today about something that I really really don’t like, and I figure that the object of my great disdain should be the subject of today’s post. Honestly... does that look appetizing? I hate bad Mexican food. Pretty much all TexMex fits into the “bad Mexican food” category. I actually mentioned this very thing in a previous post. Good Mexican food is fresh, never processed, never canned… I could do without sour cream and queso completely, but I’ll allow it every now again. The main exception there is nachos. Now, I understand that what we have in the United States has been bastardized. Especially nachos–extreme bastardization, but they’re awesome, so according to my rules they’re okay. 🙂 Overall, I maintain that Mexican food is very hard to mess up. When it’s done right, it’s heavenly, and when done incorrectly it’s a tragedy. And New Mexico has a leg up on everyone else because of the green chile factor. 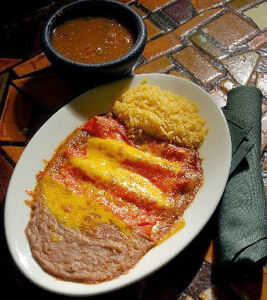 I don’t care who you are–New Mexico green chile wins every time.